ILT offers ISO17025 accredited light meter calibration services for all current models of light meters, radiometers, photometers, etc., as well as many of our discontinued models. Typical lead time for service is 1 - 3 weeks. Most ILT light meters require a two-step calibration. The meters are tested/inspected/calibrated in our electrical calibration lab, and then the meter with the sensor/filter/optic are calibrated in our state-of-the-art optical calibration lab. As part of the calibration procedure, batteries, sensors, filters and optics are also inspected. If any problems are found during the inspection, a service estimate will be provided along with a quote. It is important that ILT is notified of any problems, especially intermittent conditions, prior to receipt of the goods to assure the fastest services can be supplied. Calibration options include standard (single point calibration at one intensity), scanned calibrations (sensitivity by wavelength for sensors emitting current), linearity testing (three or more intensities), spatial response verification, filter transmission testing, and more. 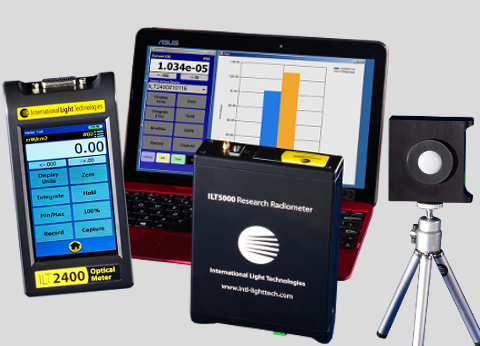 ILT offers spectral calibration over the wavelength range of 200 - 2500 nm. (Above 1600 nm requires engineering review prior to quoting). Optical calibrations are available for power/total flux, irradiance/illuminance, intensity and radiance/luminance for direct readings in W, Lumens, Lux, W/cm2, W/cm2/nm, W/cm2/sr, W/sr, Candela, cd/m2 and more. Please note that not all sensor combinations are possible depending on the spectrum/bandpass, filter weighting, peak wavelength, and dynamic range of the system configuration. In cases where one meter can be used with many sensor/filter/optic combinations, servicing/calibration may not be available. 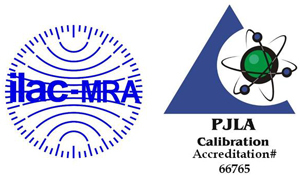 Meter/electrical calibrations are performed over the range of 1 pA to 1 mA, depending on the model. To send your meter in for calibration / service, use the Request an RMA button above to fill out the form. If you request a quotation prior to service, select "Yes" for the Quote Needed Prior to Service question. Below is a list of meters/items that ILT no longer fully services. If you have a question on your specific meter, or would like to speak with an ILT specialist, you can email us at ilservice@intl-lighttech.com, or contact us by phone at 978-818-6180 x118. Items No Longer Fully Serviced by ILT. Click on the replacement item to view alternative.